Are you looking for a very simple, yet entertaining gambling game that offers a high chance of winning? You have just found it, as casino war is a game exactly of that kind. I really doubt that there’s a casino game that is simpler to play than this. War is also highly spread across gambling sites and can be found at pretty much any site out there, such as Bet365 Casino. So what is this game really about? It’s a card comparing game between the dealer (house) and player, similarly as BlackJack. However, that is just about the only thing similar to the so called 21. In Casino War, player predicts that the card dealt to him will be of higher value than the dealer. As an alternate option, you can also place a wager on a ”tie” – predicting that player and dealer will both be dealt the same card. Player To Win – wager money and predict that you’ll be dealt a higher card than the dealer. If you get dealt a higher card than the dealer, you’ll earn an even money payout. Tie – both sides will get equally valued card. This bet features payout odds of 10 to 1 at most casinos. Yes, that’s about it and you have just learned to play Casino War! That’s definitely true, but I think you should be aware of a few more things, including what happens when a ”tie” occurs. War – move on and fight the casino once more. Both you and the dealer will get an additional card dealt to determine the winner. Surrender (Fold) – recoup half of your wager and move on to the next round of war. If you’ve wagered on a ”tie”, you’ll earn a 10 to 1 payout and these options won’t be offered to you. Except if you have made wagers on both, player to win and a tie. 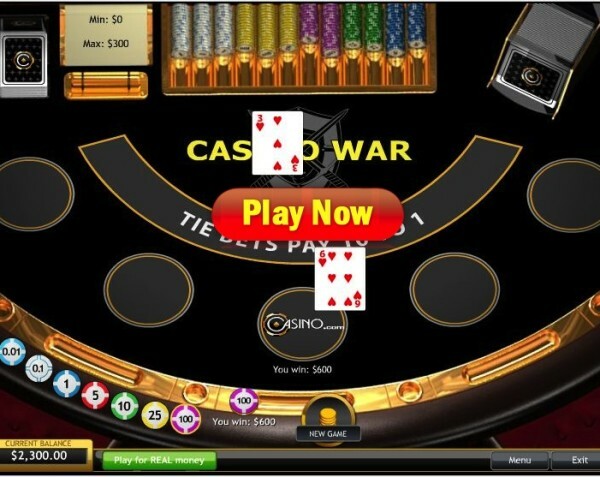 You might think that there is no valuable info or tips that you could use playing Casino War. That’s not true – the main reason this game features a house edge is because of ”tie” situations and many players surrendering. You should NEVER surrender in this game and very rarely in life anyway! You are all set for enjoying a great playing experience and going to war! However, one last thing that is missing could potentially be a great casino site for doing so. If you’re a non-US player, I would suggest joining Winner Casino for playing this game. They are powered by PlayTech and as you are a reader of our site, you’ll also be able to claim $/£30 in Free Casino Chips, just for registering. If you want to play for higher amounts of cash, you can also claim a $2,000 welcome bonus! Visit Winner Now – CLICK HERE for $30 FREE! You can also play casino war at Intercasino for sure one of the best casinos online Intercasino. They’ll treat you like a true VIP and also award with up to $/£/€ 500 free chips, when you make your first deposit! Play Casino War with up to $/€/£ 500 FREE – CLICK HERE!